Rodney Lowe sits at his desk. The Journalism Education Association granted Lowe a lifetime achievement award. 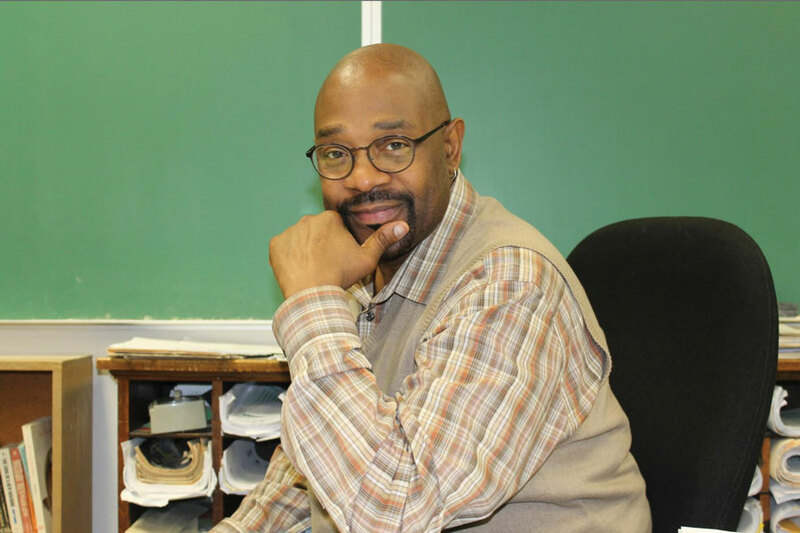 After wrapping up 31 years advising Evanston Township High School’s student newspaper, Rodney Lowe is being honored by the Journalism Education Association. Lowe, who advised The Evanstonian until his retirement, won the Journalism Education Association’s lifetime achievement award, making him one of 12 educators who “contributed significantly to scholastic journalism in 2018,” according to the association’s website. District 202 school board member Jonathan Baum nominated Lowe for the award. JEA announced the winners Jan. 25 and will honor the recipients at a convention hosted by the Journalism Education Association and National Scholastic Press Association in San Francisco on April 13. Lowe taught at ETHS for 31 years and said the award is a “crowning glory” for his 36 total years of teaching. Over the years, he said his students helped him grow as a teacher and he hopes that he influenced both their work and their character. Baum said he nominated Lowe because of his ability to nurture students. Baum added that Lowe knows how to bring out the best in the paper’s writers and editors, including Baum’s own three children. Baum said ETHS parents and The Evanstonian alumni have shared similar sentiments about Lowe. Trinity Collins, an ETHS junior and news editor for The Evanstonian, said she misses Lowe’s presence on the paper since he retired after the last semester. She said Lowe influenced her writing and helped her gain confidence in school. Going into her freshman year, Collins said she was shy and did not feel comfortable speaking in front of large groups, but has since overcome that largely due to Lowe’s guidance. ETHS senior Michael Colton, co-executive editor for The Evanstonian, said Lowe always pushed students to do their best, but also stressed that they learn to be autonomous with their work. He added that Lowe was willing to “defy the authority of anyone above him” and encouraged the staff to stand up for their work. Colton said Lowe was always willing to allow his students to defy him and supported them whenever they received pushback from administrators.